As brand and executive creative director for this campaign, I grew awareness and positive brand association for Esurance by aligning with Bollywood fans, a more affluent niche of the company’s broader target. This campaign was in conjuction with the Independent Film Channel’s (IFC) launch of Bollywood-themed programming. In order to achieve IFC’s and Esurance’s promotional goals, I conceptualized a two-pronged approach for the campaign: 1.) A user-generated content contest whose winner would be featured in Esurance’s commercial programming on IFC (thus, increasing viewership as contestants discussed their entries within their own social networks); 2.) 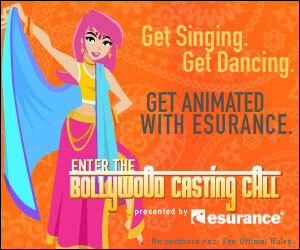 Traditional tune-ins to help promote the Bollywood programming and increase positive associations with Esurance. To get viewers engaged with both the IFC and Esurance brands, the bedrock of the campaign was a user-generated content contest, calling aspiring performers to submit videos of themselves singing and dancing– Bollywood style. Prizing included the chance to be portrayed in the long-form music video, which would be aired during several of the the Bollywood programming nights. The contest was also promoted in online banners placed on IFC and other Bollywood-related sites, and on social media through Esurance’s Facebook & Twitter accounts. Contestants uploaded their videos on a themed micro-site, where they could also view other entries and vote on favorites. The campaign’s :30 TV spot and :15 tune-ins focused around driving viewership of Bollywood programming and Esurance’s sponsorship of it. These were aired offline on the IFC and online on related sites in the weeks leading up to the launch of the Bollywood programming and the airing of Esurance’s :90 music video (featuring the contest winner). The :30 and :15 were cut-downs of the :90 long-form Bollywood music video viewable in my reel, and had customized tune-in call-to-action V-O, written by me.